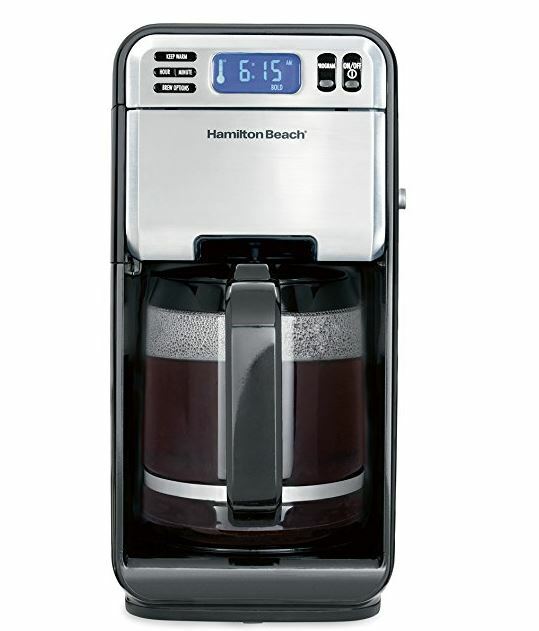 Today only Prime Members can get this Hamilton Beach Coffee Maker, Programmable with 12 Cup Capacity, Stainless Steel on sale for $32.99 Shipped (Retail $55.68)! -FAST, EASY FILLING. Rotating base lets you easily access the rear water reservoir with just a quick twist. -PROGRAMMABLE CLOCK. Set it up the night before with the programmable clock and pour yourself a hot cup first thing in the morning. -ADJUSTABLE BREWING OPTIONS. Choose from 1-4 cups, bold and regular. -SWING-OUT BREW BASKET WITH RELEASE BUTTON. With the touch of a button, the brew basket releases from the front for easy filling of your favorite grounds. -MESS-FREE SERVING. Automatic pause and serve lets you grab a cup during the brewing process without any overflow. Plus, the mess-free pouring spout and nonstick warming plate make for easy, clean serving.